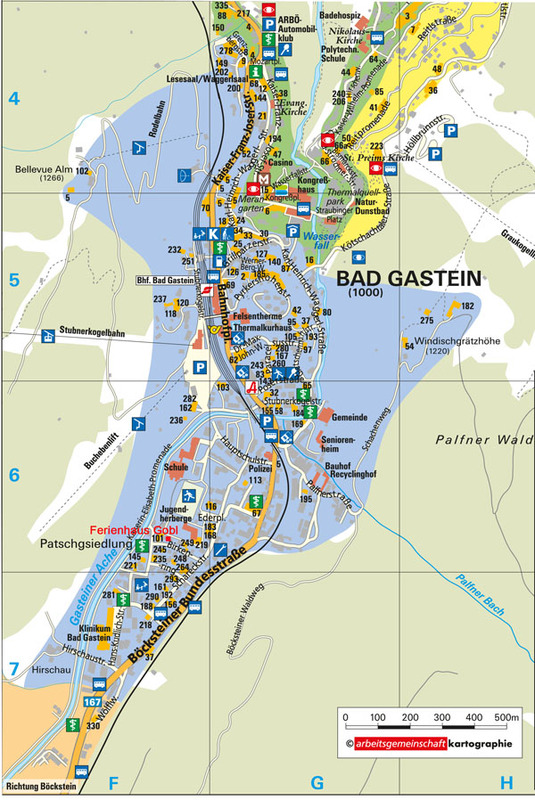 The holiday flat Gobl is located central, about 600m south from the Bahnhofsplatz (trainstation) in Bad Gastein. Shops, baker, apothecary, banking house, buying center, sports outfitters and ski rental are reachable in a few minutes by foot. The Stubnerkogel skilift as access to the ski center Stubnerkogel - Schlossalm and the thermal spring Felsenbad is located in the same distance. The close bus station provides access to the ski center Sportgastein. The cross-country ski run to Böckstein, the icestock sport track and the natural ice scating rink are also in this area. For physical well being and entertainment there are diverse restaurants, coffe bars, nigt clubs and the casino.